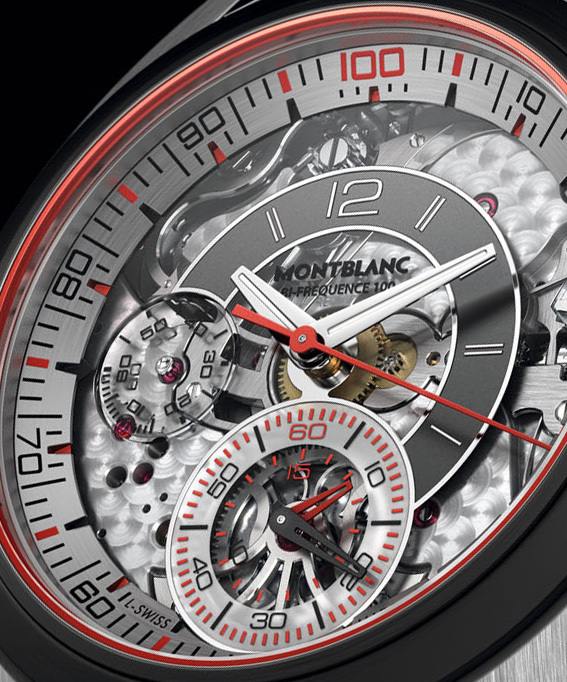 Montblanc TimeWalker Chronograph 100 can measure up to 1/100th of a second, thanks to a second balance wheel running at 360,000 bph, presented in a titanium and carbon fibre case. A nod to historical Minerva stopwatches, the Montblanc TimeWalker Chronograph 100 has a Minerva developed calibre, the MB M66.25, which can measure up to 1/100th of a second. 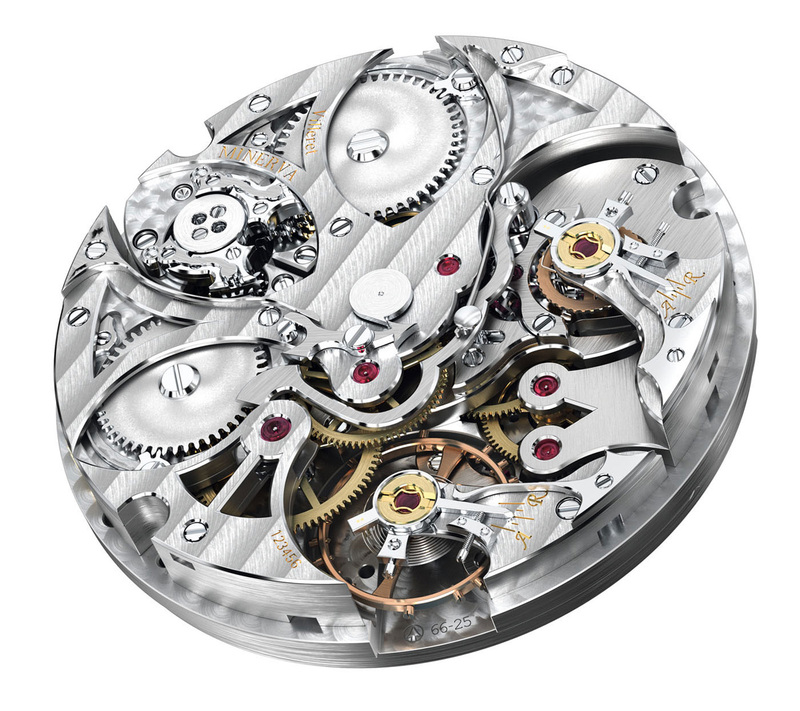 This is actually a tuned down, and much more affordable, version of the movement developed for the TimeWriter II Chronographe Bi-Fréquence 1000, which went up to 1/1000th of a second. With the 1/100th of a second indicated by the red central hand, the TimeWalker Chronograph 100 uses the classic solution for high frequency wristwatch chronographs, separate barrels, going trains and balance wheels for the time and chronograph. With its balance wheel running at 360,000 bph (which translates into 6000 beats per minute and 100 per second), the chronograph function has a power reserve of 45 minutes. The timekeeping part of the movement, which runs at a leisurely 18,000 bph, has a 100 hour power reserve. Both are wound via the crown, clockwise for the time barrel and the other way for the chronograph barrel. 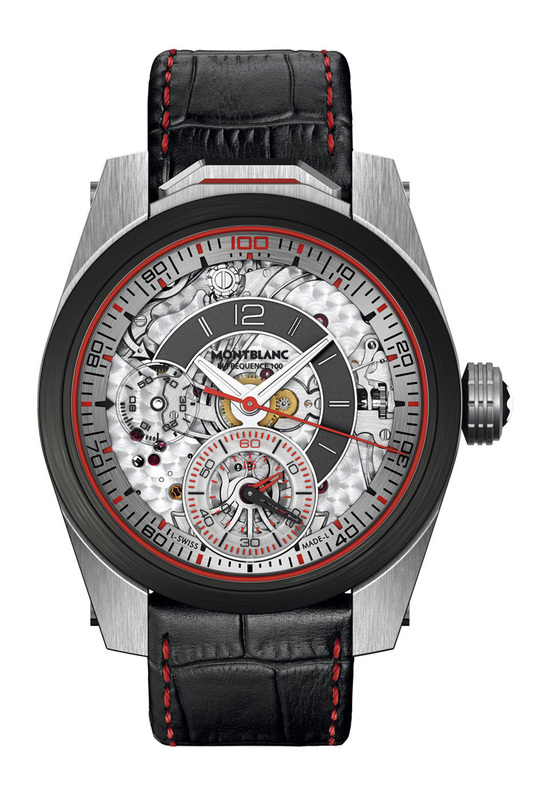 The large, 45.6 mm case sets a new aesthetic direction for Montblanc. 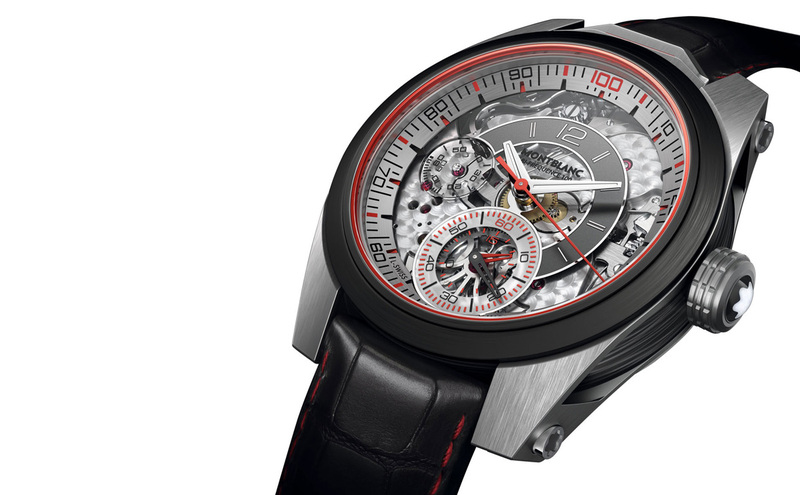 There are strong hints of the Jaeger-LeCoultre Extreme Lab chronograph in this design, unsurprisingly. Carbon fibre forms the case middle, while the lugs and back are titanium. The bezel is also titanium, but coated with DLC. A single button for the start, stop and reset of the chronograph lies at 12 o’clock, inspired by pocket stopwatches. Made of clear sapphire, the dial reveals the base plate of the movement. At nine o’clock is the running seconds, while the elapsed seconds and minutes are co-axial at six. The elapsed seconds run to 60, while the minutes, 15. The movement is visible through the display back and is somewhat incongruous with the modern style of the case and dial. Because the movement is based on a classic Minerva chronograph calibre, it has several elements of early twentieth century watchmaking, most obvious in the large, screwed balance, swan neck regulator and Breguet overcoil. Limited to 100 pieces, the TimeWalker Chronograph 100 will retail for €50,000, or about US$67,700, about a fifth of the Bi-Fréquence 1000 which retails for over US$300,000. Lange has just unveiled a smaller version of the time-only Lange 1815. It still retains the same 1815 aesthetic and L051.1 movement, but with some minor tweaks to the case.